This dude's name is apparently Chris Williams, but he wants us to call him "Swaggy C" and doesn't even tell Ross about his given name. He opens up his hoodie to make sure Ross can read the word and Ross seems enchanted with this. Ross: Oh! You branded it! Swaggy: Yep. I'll be the only person in there with something written on their shirt. Ross: You're sure about that? You're positive? Swaggy is pretty sure about that. He is from Bridgeport Connecticut, the "203", and Ross wants to know his profession. Ross: A day trader....like a stock trader? Ross, clearly intrigued: Do you go by Swaggy C all the time? Swaggy: Um, Chris is my actual name (air quotes) but I go by Swaggy C, everybody calls me Swaggy C, all my social media handles are Swaggy C, so that's what I go by. Ross isn't ready to let it go yet, and wants to know if he's planning to tell the house guests that his name is Swaggy C.
Swaggy C: Yes, that is the only thing I will do. People say you shouldn't come in like this, you shouldn't be too much of a threat, but it's the ONE THING I'm gonna do, is say I'm Swaggy C. There's no other way to walk in. Ross: I get it. You've gotta be you. You've gotta do your thing. 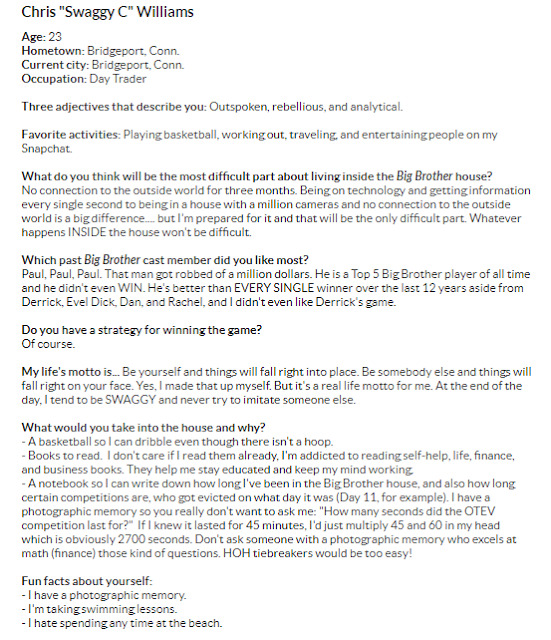 Since I first wrote Swaggy C's intro post, I've had the chance to learn more about him through a few more interviews conducted by other reporters. "Chris" was dating a girl about five years ago when he was in college (yes, he went to college) and was devastated when she broke his heart. So that is when he decided to change his whole persona and "Swaggy C" was born. He is still friends with that girl, too. 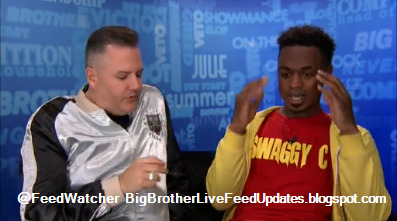 Swaggy C feels he's going to win the whole thing, and he's thought about his strategy and it "keeps getting realer and realer all the time". 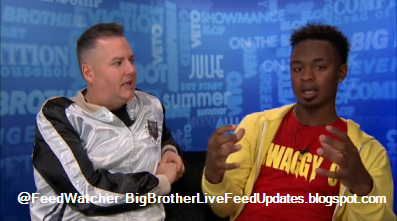 Ross invites him to tell us all about it, and has to point out that none of the other house guests will hear any of this conversation. The information just bursts out of Swaggy's month, but I'm not sure I'd call it a strategy. 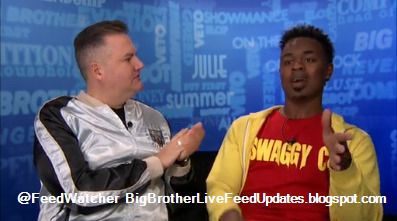 He says he is going to stroll in there and introduce himself as Swaggy C, win the first HoH because people who say it's a curse don't know what they're talking about. 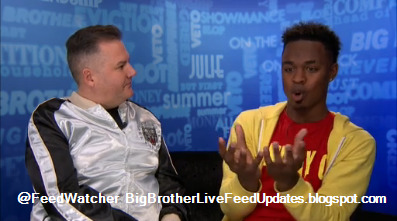 Then he's going to lay low for a few weeks and let the first HoH target on his back die down while other people put themselves out there, and then make Jury and from there it "should be" (air quotes) smooth sailing from there. Oh, and also he has a "photographic memory" so that may help him in competitions. So, that's a lot, isn't it? Swaggy C makes it all seem so simple, doesn't he? Swaggy agrees that you can't go in there with a set plan, you have to be able to adjust. In fact, all of that might go out the window on day #1, but that's his plan and he'll need to adapt. In the video, I noticed Swaggy C leaning away from Ross at this point, trying to get a little space. Ross wondered what his weaknesses might be that could cause trouble for him in the house. 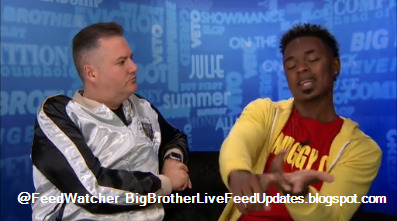 Ross shrugs and says he should ask Jeff and Jordan about that, because they did well. Swaggy: Jordon won. And Rachel and Brendon...Rachel won. The girl won and not the guy. I'm in there for myself right now! 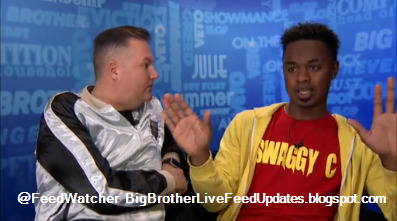 Swaggy C seems quite irritated now, discussing this topic, and is visibly leaning away from Ross. Ross: So you're resisting all chances of a showmance. Swaggy says he won't resist it, but then talks in circles about how if she's in the way of him and winning the money and he actually likes her, he won't do it, because he's in this for himself right now. Or something like that. Swaggy is nearly horizontal right now in there, he's leaning so far to the left on that little couch. Ross can't help noticing that Swaggy C. seems confrontational, and Swaggy nods and says absolutely he will confront someone. Ross wants to know what type of things may set Swaggy off and cause him to have to say something about it. Swaggy launches into quite a list of behaviors that might offend him. * People "lying on him"
Ross isn't sure he heard this right and wants to confirm his understanding of what was just said. Ross: So you know that there is deception in this game, right? And every time it happens you're gong to call someone out? Swaggy only plans to call someone out 99% of the time, because he thinks he can switch the target over to that other person in front of everyone. (That could work.) But he says that if what they're saying is the truth about him, he can't really do much about it, but if someone is lying about him, he's going to let them have it. Oh, and Swaggy C indicates that he will do that by saying "Yo. What's up?" Now Ross asks the Big Question about the end of the game, does Swaggy want to win and be hated by America, or lose and be loved. I feel you should prepare yourself for the answer, because Swaggy C may shock you here. Swaggy, slumped in his seat: Which would I pick? Lose, and America loves me. Ross, incensed: WHAT? That's what you pick? How are you coming in here saying you're ruthless but you're worried about what they (pointing at us) think? Swaggy: Look. At the end of the day I'm a sweetheart. If I've got this ruthless side and I win $500K and America hates me, where does that get me? Ross, exasperated: It gets you $500,000 in the bank. 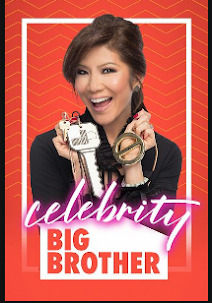 And the title of season 20 Big Brother winner. Swaggy: And then? America hates me. If America loves me then I can get back for another show, or another season.. I just found an unedited video of this interview and found the missing info.....how could I forget? 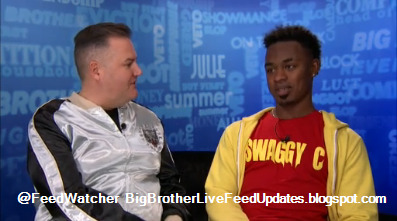 ====> After Swaggy said the line about coming back for another season he said, "look at Jessica and Cody...they were just on The Amazing Race and won a million dollars! But look at Paul...America hated him and he just got pulled from The Amazing Race! Now Ross points to the camera and tells Swaggy this is his big chance to get us on his side. Swaggy: What's happening America? What's up America? Ross, trying not to smile: ...tell us why should we root for you to win? Swaggy, taking the stage: First of all, my name is Swaggy C, and I'm coming in here with a GRAND personality and I'm coming in to play the game. I'm not coming in here just to be on TV or to get a girlfriend, I'm coming in here to play the game. Aside from all of this ruthless stuff, I've been watching this game for the last twelve years, so I feel like I know what I'm doing in there in a sense, and that's what you want to see, right? You want to see a show? An entertaining show none the less, but I'm trying to put on a show, something you can get your popcorn out and watch it with your family, and I've got the best of both worlds and I hope they see that. WHEW. I think Ross' facial expressions say it all here. What just happened was A LOT. Well, what the hell did we just watch? I haven't been this confused since last summer, after Kevin Schlehuber's interview with Big Jeff. 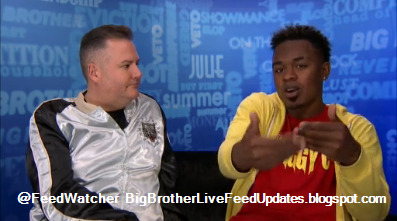 But Kevin turned out to be one of the most refreshing house guests in years, even though he wasn't much of a Big Brother player. But in Kevin's defense, he had never really seen the show. He'd seen a lot of life, but not life in the Big Brother house. So what's Swaggy C's excuse? He can't possibly have watched the show for 12 years and think that calling people out and blowing up on them is a good idea. Oh, it's a good show on TV though, so maybe that's what Shaggy is after here. And maybe that's what the shirt and the constant refrain of "I'm Swaggy C." "I'm Swaggy C." "I'm Swaggy C." "I'm Swaggy C." is all about. Making the most of his time in this BB Arena. Getting the most bang for his BB Buck. I tried digging up some dirt on him but with a name like "Chris Williams", it's kind of hard to nail down without info about his college, or name of his employer, etc. And believe it or not, there are quite a few social media accounts containing some version of "Swaggy C". All I could find is the following picture, but that's it. According to this, Swaggy C clocks in at a cool 6'4", so he's taller than the average bear. Let's take a quick look at Swaggy's CBS Bio. He's definitely got the gift of gab. I think his comments about Paul are hilarious, and probably true. 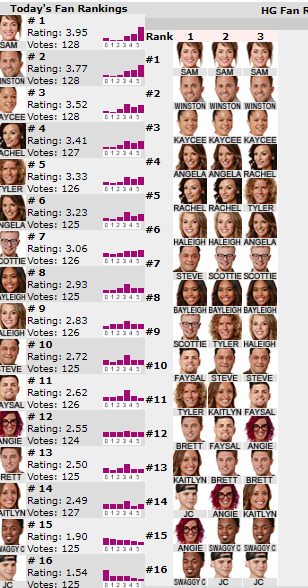 You can't deny what Paul did last season, even though certain members of the Jury denied it with their salty votes. I LOVE his three words to describe himself: outspoken, rebellious, and analytical. Even just coming up with those three words shows that Chris is thinking outside of the box. I wonder if he went to college, or what sort of education he has. I also love that he's a reader, and is so cocky about his ability to crunch numbers. I'm not sure he knows what a photographic memory is though. I'm not saying he doesn't have whatever he thinks that means, but I guess he could mean that he could memorize the scoreboard of any competition and remember who had what time, or how many points, etc. That would certainly be a useful skill in the event of a tie, but you've got to get to the tiebreaker first. When I watched Swaggy's interview with Ross when it was streaming live, I was so grateful for him, because I was getting burnt out and had just struggled through JC's interview with Ross. (Spoiler Alert: I HATED HIM.) so watching a bodaciously articulate braggart like Swaggy C was just what I needed to lift my spirits and have a few laughs. But clearly not everyone felt that way. Take a look at today's house guest poll at Jokers Updates. Swaggy C and JC are platooning down there at the bottom. I don't think that's necessary, ya'll. 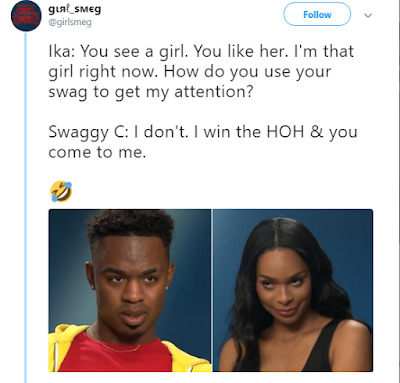 I think Swaggy C will bring some much-needed drama and humor to the situation for as long as he's in the house this summer. Did you see his face when he started addressing America at the end? He wants to put on a damn show for us, so let him. Let him put on a show for us. I want to see it. I want to see a CINDERELLA story with Swaggy C's game this summer. Did you watch BBOTT? Remember Justin Duncan? 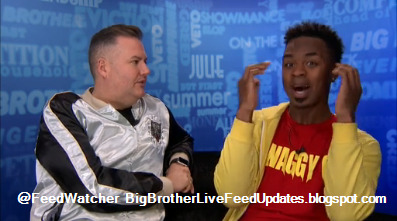 He kind of flamed out at the end of the season, but for the rest of the time Justin was God's Gift to the live feeds. You never knew what was going to come out of his mouth and it was great. Remember the pizza song? 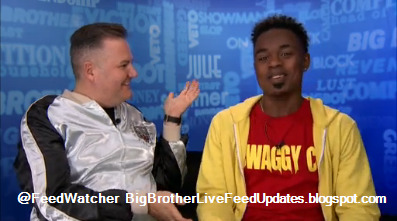 Anyway, I'm hoping Swaggy C can deliver some moments like that to BB20, and give us all a good show as he interacts with all of those diverse personalities and I hope he talks about his day trading operation. Let's try to keep an open mind, okay? Well, I'm older and probably not quite as hip as most of the cast, but if you give your self a name, and put it on a t-shirt and cram it down my throat, I'm thinking you're going to get on my nerves real quick. But we'll C... (See what I did there? c=See=Shaggy C) Yeah, it's going to get old. Swaggy P won an NBA championship this year so maybe Swaggy C can do the same.